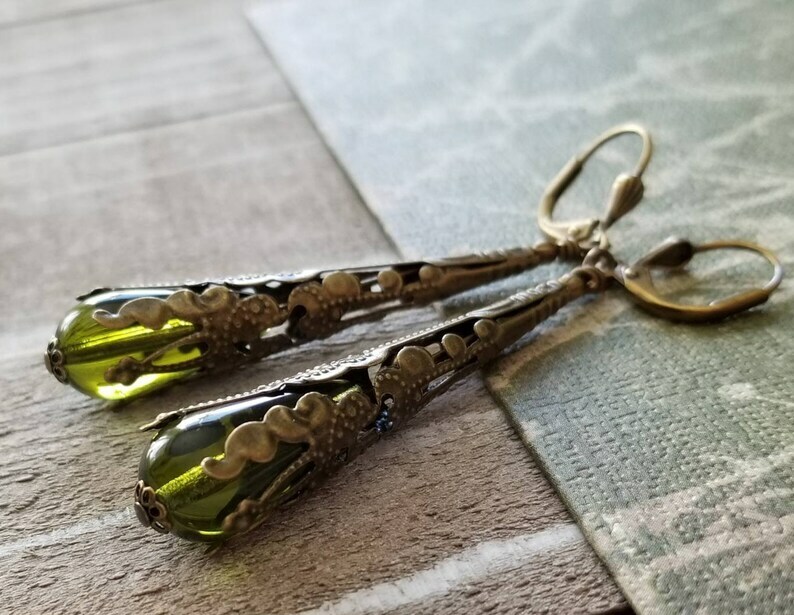 Long and elegant, these olivine glass drops are tucked up into beautiful antiqued bronze filigree cones. Go back in time to a statelier era. Feel elegant in your vintage olivine green with a Downton Abbey or Victoria touch. Choose your earwire of preference at checkout. Let me know if you need a larger amount for weddings. See similar earrings with gold pearls here, https://www.etsy.com/listing/682466263/golden-pearl-long-filigree-antiqued? Beads are made of glass and are 8mm in diameter at their widest point and made of glass. Earrings fall 2.5" from the top of antiqued gold plated brass earwires. Choose your preferred style at checkout. ~~Thank you for visiting my shop! Please don't hesitate to msg me with any questions. Gorgeous. Pure and simple. My ordering experience is always fabulous and the products are always more beautiful than the images can show. Doing business with Magpie is a wonder and a blessing!